These new handsets target the mid-range market sector, offering rich sets of features for their prices, including dual-camera setups (only for the Sense 55s and Diamond Alpha). All are expected to hit the market next month. 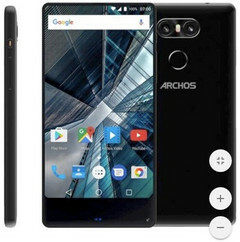 French maker of affordable phones and tablets Archos is back with no less than four handsets, all expected to hit the market next month. These new devices will join two existing families of Archos products, namely Diamond (Alpha and Gamma) and Sense (50x and 55s). All these four handsets run Android Nougat and should hit the market in July. The prices start at €169 EUR for the Sense 50x - around $190 USD, going as high as €299 EUR ($333 USD) for the Diamond Alpha, after a €50 EUR discount.